Port wine stains are always present at birth. 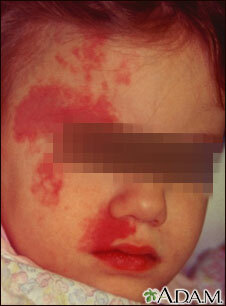 In an infant, they are flat, pink, vascular lesions. Common locations include the face and neck, but they may be present anywhere on the body. Port wine stains may appear in association with other syndromes.